How, and where, and for what should the money for public schools be spent? Barbara Dalio at last Friday’s announcement of the $100 million donation. The Dalio Foundation’s pledge last Friday to donate $100 million toward Connecticut’s schools is being hailed as good news, but it also opens a Pandora’s Box of questions that lawmakers must answer with less than two months before the legislative session adjourns. Just how many of those dollars — and the matching funds from the state and from other philanthropic groups — must go toward poor communities? The money is intended to aid parts of the state with high rates of poverty and struggling students, but what will be the split between the urban poor and rural poor districts in eastern Connecticut? How much control should and will private donors have over where the funds are directed and how they are used? And how do Gov. Ned Lamont and legislative leaders sell this to rank-and-file lawmakers from more affluent communities even while they are being made to cover an increasing share of the state’s burgeoning pension costs? Rep. Toni E. Walker of New Haven, (right) and Sen. Cathy Osten of Sprague, Democratic leaders of the Appropriations Committee. 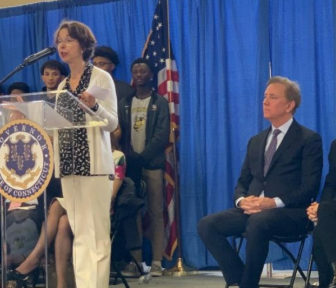 Legislators were somewhat surprised on two levels Friday when Lamont and billionaire philanthropists Ray and Barbara Dalio announced the outline of their plan Friday at East Hartford High School. The Dalio Foundation would donate $100 million to launch a new investment program in Connecticut’s schools. State government will match the Dalio Foundation’s $100 million donation over the next five years, and work with that group to raise yet another $100 million from other philanthropic groups. How will the $300 million be spent? But does that mean the funds would be spent primarily in communities that fit this profile, or exclusively in them? What about poor communities that might have smaller populations, such as those in eastern Connecticut? Sen. Cathy Osten, D-Sprague, represents many of latter type of communities in New London County. Library services, foreign language classes and various clubs and electives are vanishing as towns try to keep their school budgets affordable and their property tax rates from increasing. Could communities use private dollars to maintain existing programs, or could they only use them to add new services? Some legislators questioned whether Friday’s announcement was rushed after it was learned Ray Dalio had discussed elements of the proposal during a recent interview with CBS’ 60 Minutes that aired this past Sunday. 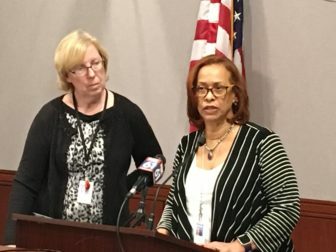 Maribel La Luz, spokeswoman for the governor, said the administration would be delivering more details on the use of the money to legislators “as soon as possible,” noting that the foundation already has a strong record of investing — and making a difference — in Connecticut communities’ and its students. “They do have some experience in this area,” she said, adding that the new initiative is built, in many ways, on already proven philanthropic investments. La Luz added that while details still have to be released on the entity that would oversee this public-private venture, it would need to include representatives from both sectors, and the public sector’s membership likely would involve appointees from the legislative and executive branches. Still, legislators said this is new ground for state government in many ways. What happens, Lavielle asked, if the state and the Dalio Foundation fail to raise $100 million in donations from other philanthropic groups? Would the state be required to make up any short fall? Meanwhile, Connecticut and the Dalios have a history in another type of investment as well. Ray Dalio heads the Westport-based Bridgewater Associates, the world’s largest hedge fund. The state committed $22 million in bonding and $30 million in tax incentives to Bridgewater in 2016 to help the firm expand facilities in Westport, Wilton and Norwalk, retain 1,400 jobs and create 750 new ones. 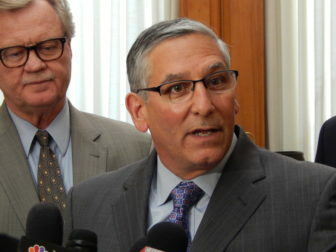 Senate Minority Leader Len Fasano, R-North Haven, said Friday that if another $100 million in taxpayers’ funds is to be committed to this new education program, it’s vital Connecticut have a strong accountability program to test the results. “When someone comes to the table and wants to contribute $100 million, your reaction has to be this is a good idea and we have to think, ‘How can we make this happen?’” Fasano said. Commissioner of Education Dianna Wentzell will take an interim position at the University of St. Joseph this summer. During her first 100 days in office, Hayes has distinguished herself as a former teacher who is also willing to be a student. Gov. Ned Lamont has asked two state education board members whose terms ended last month to return to the board for another four-year stint.